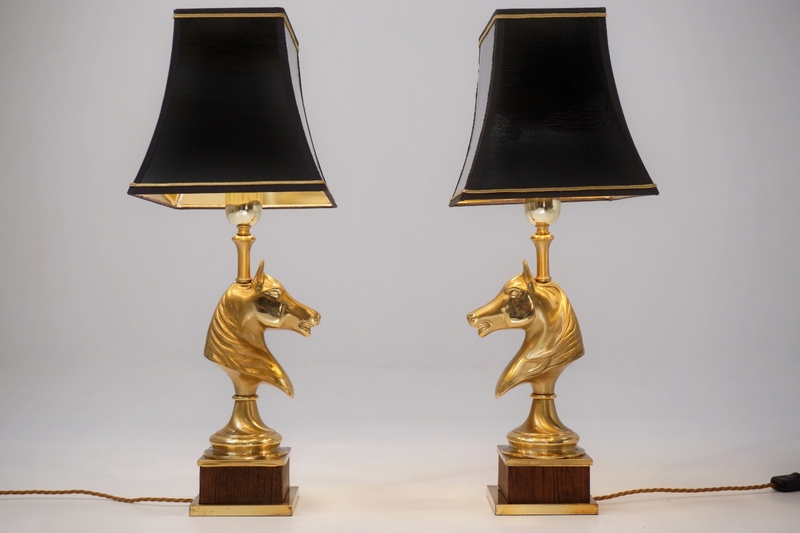 Maison Charles horse lamps, a pair in brass & wood, 1970`s ca, French. 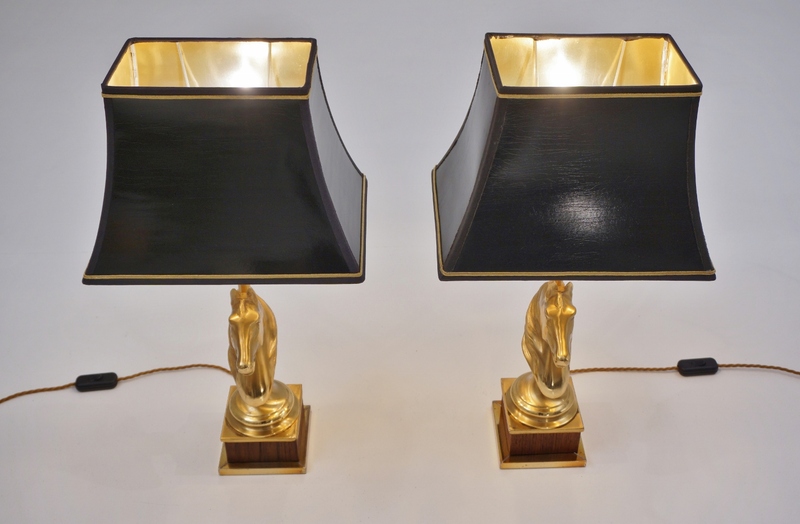 These table lamps have been gently cleaned while respecting the vintage patina. Both are newly rewired, earthed, fully working and PAT tested by an electrician. 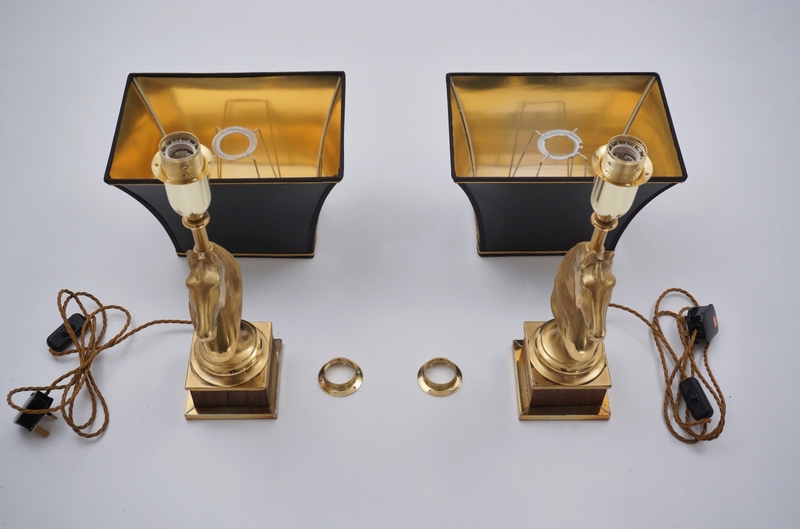 Each has a new brass metal lamp holder, gold tone silk cable & new black cord switch & new black plug. Light bulbs included. It is possible to use these lights in other countries although it may be necessary to purchase different light bulbs suitable to local electricity. 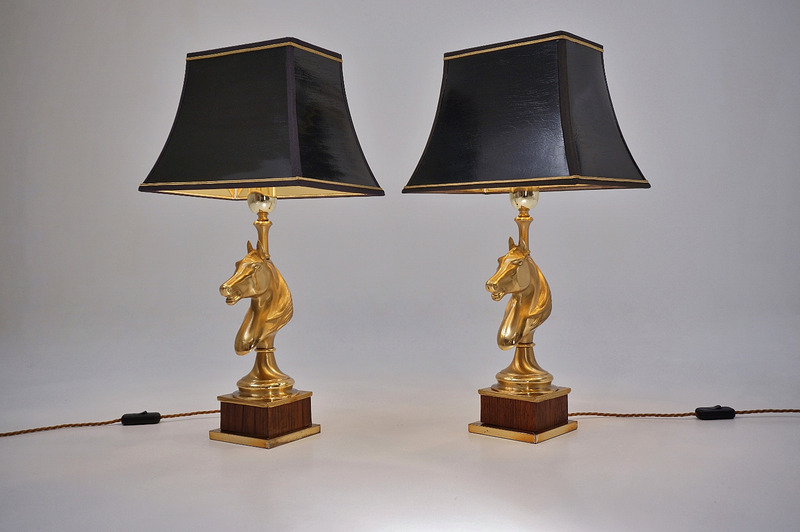 These elegant lamps have solid brass horse head columns and Neoclassical design references similar to the work by French company Maison Charles, the attributed designer. 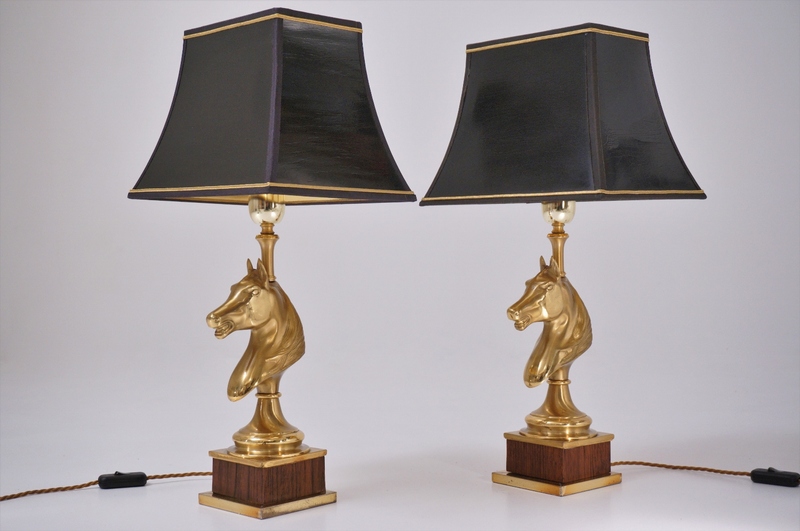 With the equestrian theme & sculptural masculine presence, they would suit a range of interiors such as Antique, Traditional, Hollywood Regency, Post Modern, Industrial or Contemporary. 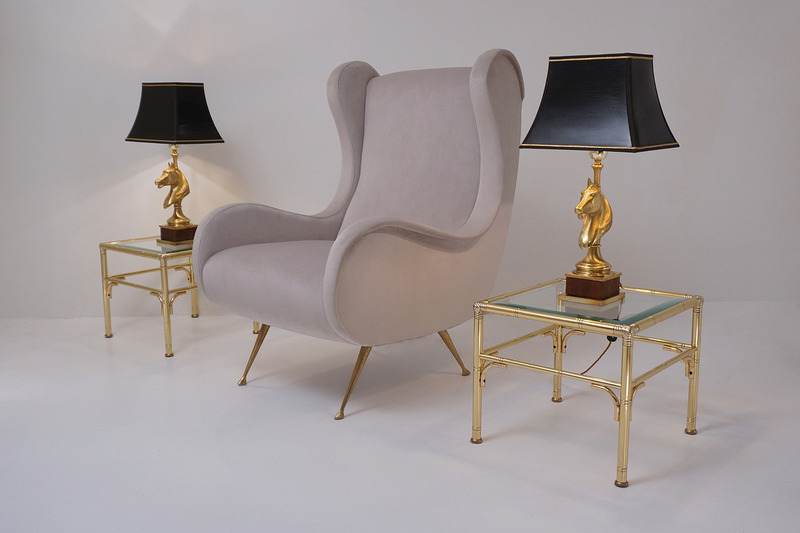 Each square base is composed as a Neoclassical column with a quality cast gilt brass horse head at the focal point. 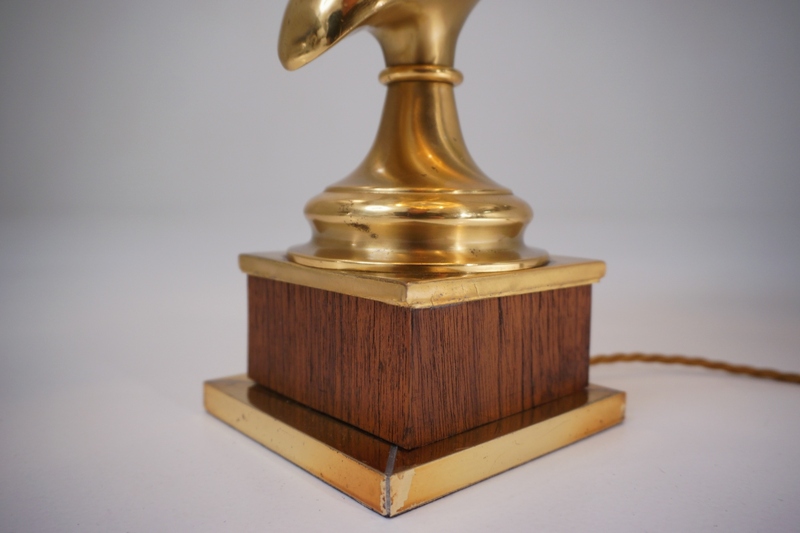 This sits on a wood & gilt brass stepped cube plinth. The richness in texture & colour of the wood complements the warmth of the gold tones. 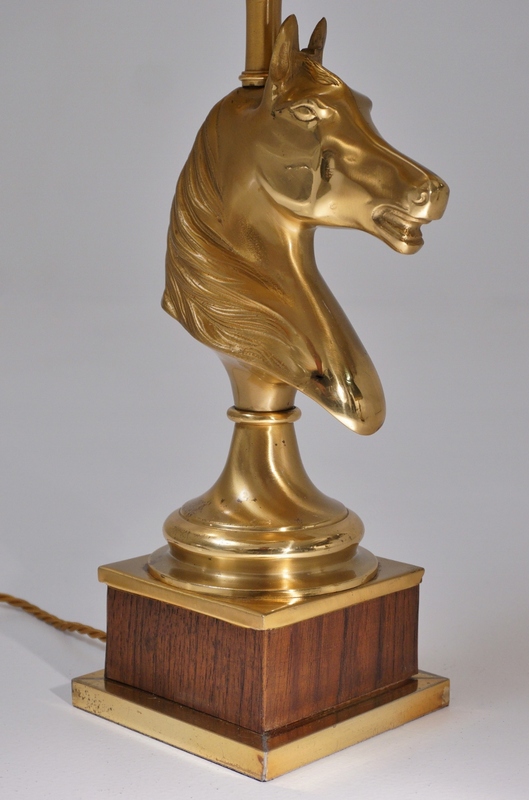 Rising from the horse`s head, there is a solid brass central column leading to the lamp holder & cover, both in brass. 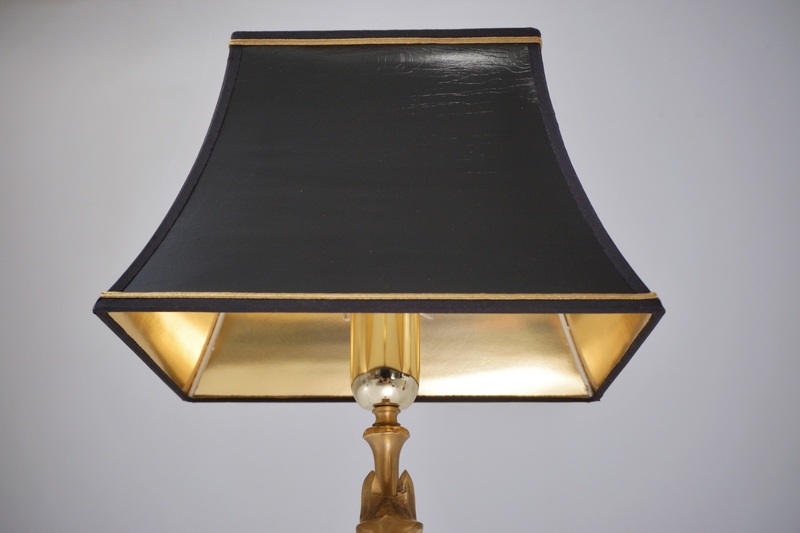 The lampshades are the original vintage ones, black gloss leatherette gold lined pagodas with a black fabric trim. Running along the top & bottom of the shade there is thin gold cord trim. Each lamp shade is screwed in place to the lamp holder by a brass ring. Each lamp takes one standard big screw light bulb E 27 up to 60 Watts. Presently fitted and photographed with Candle Clear light bulbs of 25 Watts, which are included in the price. Alternatively it is possible to use any other E 27 light bulb shapes. 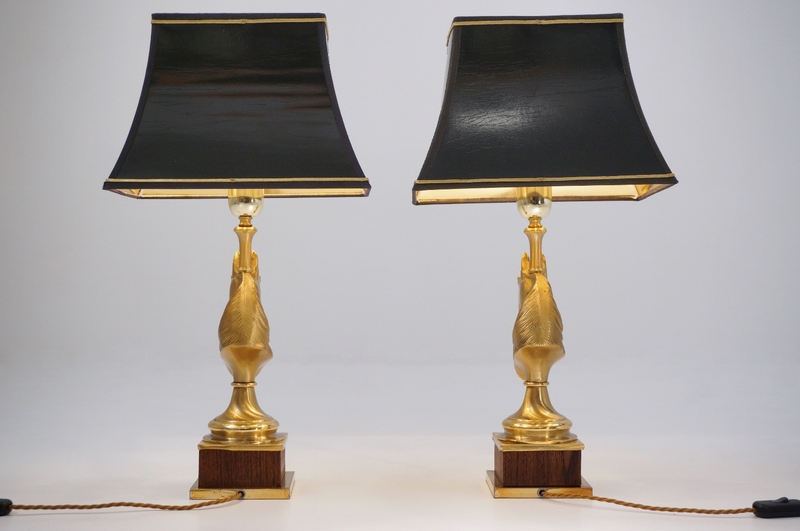 Both vintage lamps are in very good condition. The bases are in very good condition with no chips to the wood. The brass & wood surfaces have the original antique patina, including minor rubbing to the gilt & tiny marks, adding character and in line with age. The lampshades are in good condition with no cuts and only minor marks & patina in line with age. 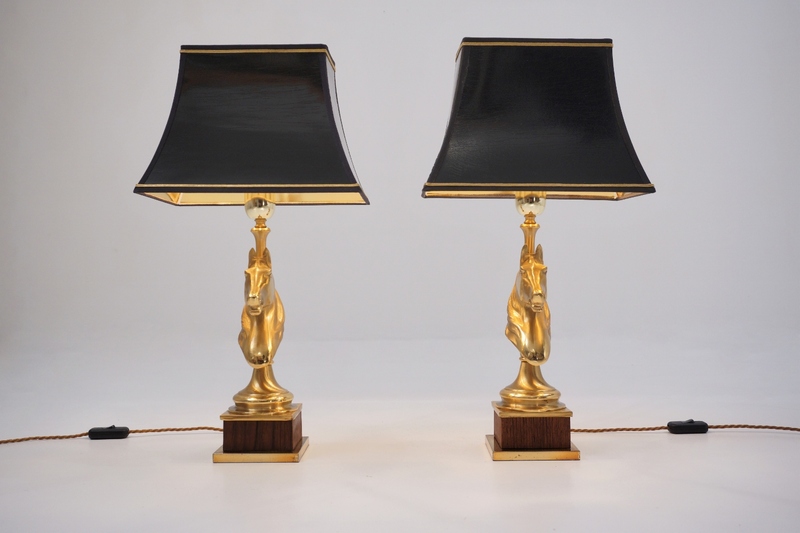 These lamps sell together and the price is for the pair. Packing is offered free of charge. We take special professional care while packing. For safe transport the shades would be wrapped separately in bubble wrap and an outer layer of card. These would be stacked together. The bases would also be wrapped separately in bubble wrap and and an outer layer of card. Together these pieces would be boxed, safe for posting or shipping with a courier. Each base alone (without the lamp shade) is Height: 42 cm; Width: 11.7 cm; Depth: 11.7 cm. 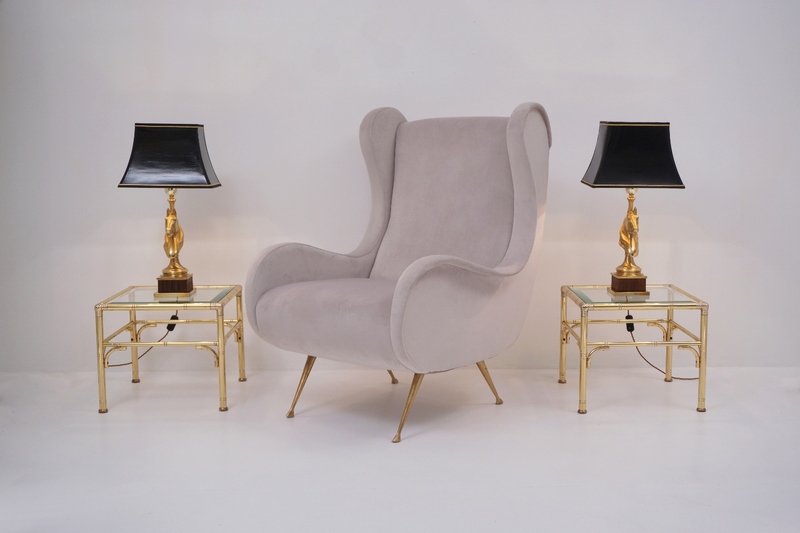 Maison Charles was founded in 1908 by Ernest Charles and is still in operation today. Read more on our Roomscape Blog about Maison Charles.